*DIY Solutions & Homemade Helpers* Doing It Better For Less! Here are the steps for how to install a kitchen faucet. I had to remove and replace our faucet to fix a leak. I also had to remove the sink to attack the mold that had started growing. Most of people don’t need remove the sink to replace a faucet, but the steps to replace a new faucet is the same. If the sink has not yet been installed, it will be much easier to reach everything and work from a comfortable position before the sink is installed. Obviously, if you are replacing a faucet, there is no need to remove the sink. Note: The hardware holds the faucet securely to the sink. The purpose of caulking or putty is to prevent water from seeping under the faucet and dripping down into the cabinet under the sink. The caulking does not need to stick the faucet to the sink. But first, you must decide which to use: Seal the faucet with plumbers putty or with some other type of caulk or sealant. When I installed the sink the first time, I used plumbers putty on the strainer assemblies, with no problems. I also used some type of silicone caulk to seal the sink to the countertop and to seal the faucet to the sink. Also no leaks. After I removed the sink to see and repair the damage from the leaking faucet, I decided it would be wise to start from scratch and re-seal all the drains in case they were bumped, just to make sure they don’t leak. Now I’m ready to put everything back together. I found my original plumber’s putty,which still looks good even though it’s a least five years old. I also have a new tube of adhesive sealant, so I checked some of the plumbing forums to see if the old putty is still good or if I should use the sealant. Wow! People are calling each other “idiots” over the question of using plumbers putty or silicone. The guys that use silicone say the the “old school” guys never learn any new tricks. The plumbers that still use putty say it has never failed them and is easy to clean up if you have to take anything apart for repairs, replacements or upgrades. I can vouch for the easy vs hard clean up. It took only a few seconds to clear away all the old plumbers putty I used on the drains, but it took me at least an hour to scrape the old silicone from the sink and the counter top. I can also vouch that we had no leaks with either the plumbers putty or the silicone for 5 years. Also, it was very difficult to remove the sink that was stuck to the counter top with silicone caulk. I can’t imagine removing the drain assemblies without damaging them if they were sealed with silicone caulk. I decided to use plumbers putty this time to seal the faucet. Tighten the nut until faucet is firmly attached to sink. 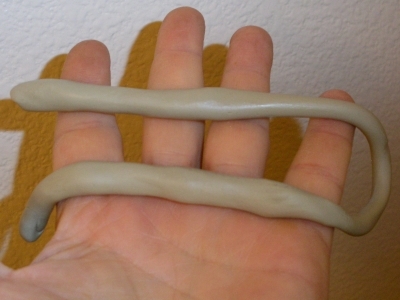 Figure 2 shows a rope of plumbers putty made by rolling a golf ball sized piece between your hands. Figure 2. Golf Ball Sized Plumbers Putty rolled into a Thin Rope. The rope shown is probably thicker than it needed to be, but it is easier to remove excess putty now than add more putty later. If you don’t do this for a living, which I don’t, we can be excused for this. If we did this everyday, we would know exactly how much putty to use. Rolling the putty will bring back childhood memories of Play-doh. Remember the hardware holds the faucet in place, not the putty or caulk. The purpose of the putty or caulk is to keep the water out, so make sure you line it up where the putty will create a seal between the sink and the faucet. You can use this same putty rope technique to seal the sink on the counter top and to seal the drain assembly in the sink. 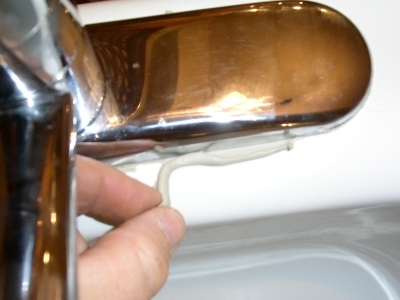 Take the putty rope and place it around the base of the faucet as shown in Figure 3. Figure 3. Rope of Plumbers Putty Applied to the Faucet Base Plate. The next step is to place the faucet onto the sink, with the tail pieces and mounting threads into the holes that have been cut or molded into the sink. Depending upon the style of faucet and sink you have, there will be usually be one or three holes in the sink that are created for one or three pipes or rods protruding from the faucet. In my case, the faucet needed three holes in the sink (Fig. 3 & 4). There are two tail pieces (pipes) coming out of the faucet on each end, one for hot water and one for cold. In addition, there is a threaded rod in the center that holds the faucet in place. Some faucets are designed so that both water pipes fit through the center hole and some combination of threaded rods, spacers and nuts are used to secure the faucet through two outer holes. Figure 4. Attaching Faucet to Sink. If you are buying a new faucet, it will include directions, but whatever design you get, make sure that it fits the same number of holes that is in your current sink. Figure 4 shows the spacer/washer in place, but not tightened over the threaded rod. 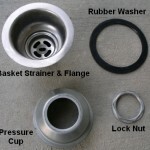 The spacer is like a washer and is large enough to span the hole. It is also deep so the nut doesn’t have to be spun down so far. This will make the nut easier to reach if the faucet needs to be removed after the sink is installed. If using putty to seal the faucet, snug the faucet securely and except for cleaning up any excess putty as shown in Figure 5, you are done. Figure 5. 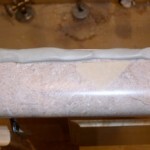 Remove Excess Plumbers Putty from the Faucet Base Plate. Note: If you are using any type of silicone caulk or sealant, snug it up only part way until the caulking skims over and firms up and becomes “rubbery”, then snug it up completely. Any excess caulking will have to be cleaned up quickly before it skims over. It would also be a good idea to mask the area with tape to prevent excess caulking that oozes out from under the faucet cover from sticking to the sink. Excess plumbers putty can simply be picked up, rubbed off and then washed with soap and water to remove the oily residue. Now that the faucet is attached to the sink, the next step is to connect the water supply to the tail pieces of the faucet. Look back at Figure 4. The tail pieces are were the hot and cold water is supplied to the faucet. Figure 6. Water Supply Valves. Figure 6 shows the water supply under our sink. The hot water supply (red) has two valves, one for the sink and one for the dish washer. The cold water supply (blue) supplies the cold water side of the faucet. 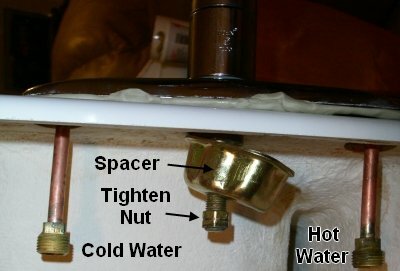 Make sure you connect hot to hot and cold to cold from your water supply to the faucet. 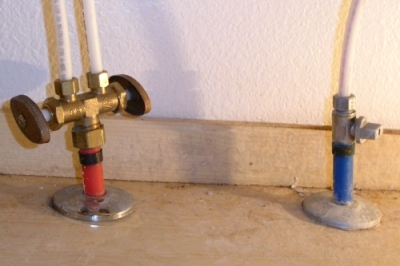 If you cross these, water will come out of the faucet, but hot will come when you want cold and vice versa and someone in your house might get burned. Water supply tubes or hoses are used to connect between the shutoff valves to the tail pieces of the faucet. If you are replacing a faucet, you may be able to use the same water supply tubes or hoses if the length of the tail pieces of the new faucet is similar to that of the old faucet. In my case, the tail piece of the new faucet was much shorter, so the old supply tube was too short. Hoses are much easier to fit because they are flexible, but they cost more. Tubes are more difficult because they are stiff. When buying new hoses or tubes, make sure the fittings are the correct size. Take the old hose to the store with you to make sure. Look carefully, there can be different sized fitting on the water supply end than on the faucet tail piece end. When tightening these fittings, we do not want them to leak. Even the smallest drip will create problems. Before attaching the nut to the threaded pipes, wrap the threads with some kind of thread seal tape. Tighten all four nuts (2 hot and 2 cold). The nuts have to be tight, but not so tight they are damaged. It is possible to over-tighten. When you are satisfied the nuts are firm, turn on the water and look for leaks. If no leaks, job well done. If one or more of the fittings leak, try tightening them a little more. If that does not fix the leak, turn off the water supply, remove the connection and wrap it again with thread seal tape and reconnect the water supply again. Check for drips regularly for the next week or so just to be safe. Now, that wasn’t so hard was it? And we didn’t have to pay a plumber $500! Did you know that Amazon now has home services? Even comes with a complete Happiness Guarantee! Do you still prefer and recommend to use Plumbers Putty over Silicone Caulk to seal the faucet ? Yes. 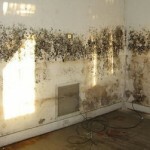 We have used plumbers putty and silicone caulk in the past. They both seal well, but if you ever have to remove something that has been sealed with silicone, it’s much more difficult to remove than the plumbers putty. Homemadehints.com does not provide medical advice, treatment or diagnosis.